Retention time resembles the 5- isomer, isomers may not be differentiated by GC/MS. Tan capsule containing soft white powder. 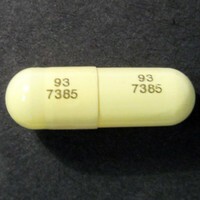 Prescription venlafaxine comes in capsules that are this color and that have these numbers (93 9385) on them -- EcstasyData has no idea how a sample of this powder ended up in a capsule that looks like a venlafaxine capsule.